River Cruise Agent is dedicated to providing up to the minute information about river cruising in general as well as river cruise companies specifically. 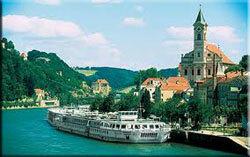 You will find exceptional exclusive special offers from our river cruise partners. IMPORTANT NOTE: If you are considering a river cruise, BOOK EARLY! Due to the incredible popularity and limited availability, people are often disappointed because they waited too long to book and couldn't take their dream river cruise vacation. With the onslaught of negative news about mishaps with cruise ships, significant attention has been directed at how passengers have been treated when these events occur. Certainly, some of the cruise lines stumbled badly in response to these incidents and gave the industry a black eye (and bloody nose) in my opinion. The Cruise Line Industry Association, the representative organization for all the major cruise lines recently adopted a CRUISE PASSENGER BILL OF RIGHTS to ensure future incidents are handled much better and passengers are assured they will be taken care of properly. I want to assure you the cruise industry is working hard to ensure peoples vacations are not disrupted or ruined. If an incident does happen, the future response will be much better than it has been in the past. 1.The right to disembark a docked ship if essential provisions such as food, water, restroom facilities and access to medical care cannot adequately be provided onboard, subject only to the Master's concern for passenger safety and security and customs and immigration requirements of the port. 2.The right to a full refund for a trip that is canceled due to mechanical failures, or a partial refund for voyages that are terminated early due to those failures. 4.The right to timely information updates as to any adjustments in the itinerary of the ship in the event of a mechanical failure or emergency, as well as timely updates of the status of efforts to address mechanical failures. 5.The right to a ship crew that is properly trained in emergency and evacuation procedures. 6.The right to an emergency power source in the case of a main generator failure. 7.The right to transportation to the ship's scheduled port of disembarkation or the passenger's home city in the event a cruise is terminated early due to mechanical failures. 8.The right to lodging if disembarkation and an overnight stay in an unscheduled port are required when a cruise is terminated early due to mechanical failures. 9. The right to have included on each cruise line's website a toll-free phone line that can be used for questions or information concerning any aspect of shipboard operations. 10. The right to have this Cruise Line Passenger Bill of Rights published on each line's website. The American Queen Steamboat Company, which operates the U.S-flagged, 436-passenger American Queen paddle wheeler on the Mississippi, Ohio, Cumberland and Tennessee rivers, has purchased the Empress of the North paddle wheeler for an undisclosed sum from the U.S. Maritime Administration (MARAD), which has maintained the vessel since Majestic America Line shut down in 2008. The vessel will be rechristened as American Empress. A U.S.-flagged riverboat, the American Empress measures 360 ft. with five towering decks and accommodates 223 guests in seven stateroom categories and will have 97 crewmembers. The American Empress will sail the Columbia River and Snake River, offering seven-day voyages between Portland, Ore. and Clarkston, Wash. Ports of call include Astoria, Wash.; Stevenson, Wash.; The Dalles, Ore.; Umatilla, Ore.; and Richland, Wash.
American Empress is set to enter service in April 2014 and will offer cruises through November. It will sail seven-day voyages between Portland, Ore., and Clarkston, Wash., on the Columbia and Snake rivers. Ports of call include Astoria, Richland and Stevenson, Wash.; and The Dalles and Umatilla, Ore. The eight-day program will include a pre-cruise hotel night. Sailings have already been entered into the American Queen Steamboat system and are available for booking effective May 22. A new brochure is being published for all American Queen Steamboat itineraries and will be sent to travel agents and past customers in early June. Over the next several months, American Queen Steamboat will completely refurbish the ship and bring it up to the standards of its existing American Queen boat and work to staff the ship with existing crew members from American Queen and other staff hired from the Pacific Northwest. Cabin configurations will be changed and the total number of cabins will be reduced to 112 outside accommodations. Like American Queen, American Empress will offer a fully inclusive product, including hop-on, hop-off motorcoach tours of the ports visited using the company’s dedicated fleet, wine and beer with dinner, free Wi-Fi (with an upgraded satellite system as was just installed on American Queen). Also like American Queen, American Empress will offer premium shore excursions for a surcharge. Dining will feature specialty cuisine from the Pacific Northwest with a menu designed by Regina Charboneau, who also is the culinary consultant on American Queen. A large show lounge will feature nightly entertainment with two shows a night geared to the region. Theme cruises will focus on such topics as Lewis & Clark and wine-focused sailings. Other attractions will include venues developed in concert with American Queen Steamboat’s new partner, the National Trust for Historic Preservation. Typical pricing for a nine-day, eight night sailing will be roughly $3,795, according to Sykes. A U.S.-flagged riverboat, the American Empress measures 360 feet with five decks. It was originally built in 2002 for American West Steamboat Company and was later acquired by Majestic America Line, which operated it until 2008 on Alaska’s Inside Passage and the rivers of the Pacific Northwest. American Queen Steamboat Co. has formed a partnership with the National Trust for Historic Preservation, a privately funded nonprofit based in Washington. Beginning June 30, the American Queen Steamboat Co. will donate $5 to the National Trust for every booking, in support of the campaign to protect National Treasure sites along the Mississippi River and in the Pacific Northwest. Through the partnership, American Queen Steamboat Co. and the National Trust for Historic Preservation aim to “help tell the stories about important historical places along the travels of the ship,” said Terry Richey, chief marketing officer for the National Trust. Passengers will have the opportunity to visit three National Treasures sites on their cruise: the Mississippi Delta Heritage area, Willamette Falls in Oregon and the Manhattan Project in Hanford, Wash. If travel sellers could accurately predict the weather, that would obviously make selling vacations a lot easier. Absent such skills, however, one thing river cruise sellers can (and probably should) do is check how recent weather has affected water levels on rivers their clients are soon to be traveling on. As worldwide weather patterns become increasingly erratic, sudden dry spells or, conversely, unforeseen heavy rains can have a significant impact on river cruise itineraries. As with the Mississippi River last year, a drought can limit vessels’ ability to pass through certain stretches if water levels are too low. And if a river is subject to severe rains, the higher water levels can make it impossible for ships to pass under bridges or make the rivers unsafe to travel on, as was recently the case on the Douro River in Portugal. Having been on the Douro in early April during a period of higher-than-average water levels that prevented river cruise vessels from sailing for a short period, one thing passengers repeatedly expressed was that prior to that experience, checking the river’s water levels was not something they would have necessarily thought to do before leaving for a river cruise. A lot of passengers just assumed that rivers are pretty reliable. Enter the travel seller, who can help monitor those water levels. And the easiest way to do so is to simply research local news articles (as well as Travel Weekly, though we admittedly don’t catch every single rise and fall of the world’s inland waterways) about the rivers or regions the river cruise will be on/in. If regional weather patterns look like they might affect water levels, then the next step is to simply ask the river cruise line point blank whether the itinerary will proceed as planned. The challenge, of course, is that oftentimes even the river cruise companies themselves don't know whether there will be changes up until the last minute. It’s in everyone’s interests for the sailings to go as planned, and so they will often try to hold off on any premature cancellations or itinerary alterations. But it doesn’t hurt to ask, several times if necessary. We are a specialized travel service focusing on premium leisure land and cruise travel and select business and association travel and event planning services. Our flagship brand, World Voyager Vacations features premium cruises, cruisetours and land resort vacations to destinations throughout the world with major cruise lines, tour and resort operators. Supporting that effort are our leisure websites www.alaskacruisesandlandtours.com www.gooddealsoncruises.com and www.rivercruiseagent.com. Combined, they provide endless opportunities for individual and family and friends group vacationers. We have a dedicated website for group travel which is www.grouptravelcoordinator.com. Our business and association services division features meeting and incentive program event planning and execution. Our focused business and association websites include www.meetingsandincentiveprograms.com, www.meetingsonships.com, www.incentivetraveladvisors.com and www.meetingsatallinclusiveresorts.com.